This is the first game in the Alien Breed series. For other games in the series see the Alien Breed category. 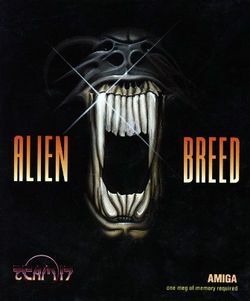 Alien Breed is a horror game released by Team17 in 1991. In this game, two soldiers are sent to investigate a space station that stopped transmissions, with the station being eerily quiet when they land. The gameplay is similar to Gauntlet, with an overhead view and being able to shoot in eight directions. An enhanced version, Alien Breed Special Edition 92 was released a year later. This page was last edited on 29 May 2016, at 18:13.